Beginning 2011 Marcos Jimenez was appointed CEO for Softtek USA and Canada, while continuing as a member of the organization’s Executive Board. Marcos joined Softtek in 1992, and quickly became a partner of the Banking business unit, to later venture into opening Softtek Peru. This enterprising effort provoked a domino effect in his professional career, and meant his past 19 years have been dedicated to Softtek. During this journey, he faced various challenging roles: a key entrepreneur in Peru, a sales leader in the U.S., and CEO for Softtek Spain and the U.K. Since 2004, he has been responsible for Sales and Marketing of Softtek USA, where he managed to double the company’s profitability within a short time frame. Belisario Contreras is the Cyber Security Program Manager at the Secretariat of the Inter-American Committee against Terrorism (CICTE) of the Organization of American States (OAS). As Program Manger he provides programmatic and management support to the CICTE Secretariat in the planning, organization and execution of cyber security initiatives in the Americas including the Creation and Development of Computer Emergency Response Teams (CERTs); Provision of Technical Training; Implementation of Crisis Management Exercises; Capacity building on Industrial Control Systems (ICS), and coordinating outreach and collaboration with other international and regional organizations working on cyber issues. Since 2007, Mr. Contreras has played a part in the growth and improvement of Computer Security Incident Response Teams (CSIRTs) in the Americas, and has worked closely with Latin American and Caribbean governments on the development and adoption of National Cyber Security Strategies and Policies. He has spearheaded liaison and promoted strategic partnerships between the OAS and key international actors. Mr. Contreras is a Colombian citizen, and prior to joining the CICTE Secretariat worked at the Young American Business Trust (YABT), and he was a fellow of the Department of National Planning of Colombia in 2011. He holds a Bachelor in Business Administration from the Universidad Francisco de Paula Santander, and a Master’s Degree in Latin American Studies from the School of Foreign Service at Georgetown University. Joseph Guzman is Interim Director of the Chicano/Latino Studies (CLS) Program and Michigan State University. Dr. Joseph M. Guzman joined CLS through a joint faculty position with the School of Human Resources and Labor Relations. Dr. Guzman has served as First Deputy Assistant Secretary (DAS) of the US Navy, Office of Comptroller and Financial Management and a DAS in the Air Force, Office of Personnel Management and as Director of the DoD Biometrics Management Office. Previously, Dr. Guzman served as a senior think tank policy analyst and a Visiting Assistant Professor at Georgetown University. Dr. Guzman holds a Ph.D. in Economic Analysis and Policy from the Stanford Graduate School of Business and advanced degrees in economics, statistics and business research from Stanford University, together with an MBA and undergraduate engineering degree from the University of Arizona. Dr. Guzman is President of the American Society of Hispanic Economists (ASHE) and has been named to the Top 100 Hispanic Influentials List and one of Ten to Watch by Hispanic Business Magazine. Dr. Guzman received the 2015 Michigan Educator of the Year award from the Michigan Civil Rights Board, Hispanic/Latino and Hispanic Caucus Commission. Seth Stodder was appointed by President Obama to serve as Assistant Secretary of Homeland Security for Border, Immigration & Trade Policy in March 2016. Assistant Secretary Stodder leads a team advising Secretary Johnson and DHS leadership on border security and the facilitation of legitimate travelers and commerce across U.S. and international borders. Leading the offices of Immigration Policy and Immigration Statistics, he also advises the Secretary and DHS leadership on all immigration matters, including immigration reform, visa policy, global asylum/refugee policy, immigration services, and immigration enforcement. He also oversees DHS policy regarding trade, cargo and supply chain security, transportation security, as well as DHS national security reviews of foreign investments and FCC license applications through the Committee on Foreign Investments in the United States (CFIUS) and the “Team Telecom” review process. In addition, Assistant Secretary Stodder oversees all DHS engagement with and policy issues regarding the countries of the Western Hemisphere, including bilateral and multilateral engagements with Canada, Mexico, and the countries of Central America, South America, and the Caribbean. Previously, Assistant Secretary Stodder served as Assistant Secretary of Homeland Security for Threat Prevention and Security Policy. Appointed by President Obama in June 2015, Assistant Secretary Stodder led a team advising Secretary Johnson and senior DHS leadership on a wide variety of issues relating to security threats to the U.S. homeland. Among other things, Assistant Secretary Stodder oversaw DHS policy on the screening of people, including the Visa Waiver Program and the security vetting process for refugee applicants, as well as law enforcement policy, and the negotiation of international information sharing agreements bolstering counterterrorism and law enforcement cooperation, with a particular focus on transatlantic cooperation in addressing the Syrian migration crisis. Assistant Secretary Stodder also served as Co-Chair of the DHS Social Media Task Force. Assistant Secretary Stodder is a member of the U.S. Supreme Court and California bars, has a J.D. from the University of Southern California Law School, and a B.A. from Haverford College. José M. García was appointed Representative of Mexico’s Ministry of Finance to the United States in February, 1996. Prior to his appointment, Mr. García occupied the position of Deputy Representative since July 1992. In these capacities, Mr. García has been the leading negotiator and the coordinator of the working groups created to develop and implement the customs initiatives under the US-Mexico Customs Bilateral Strategic Plan, which was signed between Mexico´s Ministry of Finance and the US Department of Homeland Security and include, among other initiatives, the cargo pre-inspection pilots, the customs data exchange mechanisms and the single manifest initiative. He also was the coordinator of the customs working groups under the North American Security and Prosperity Partnership, as well as those under the U.S. – Mexico Border Partnership. Previously, Mr. Garcia was the coordinator of the working groups created for the negotiations of the Uniform Customs Regulations of NAFTA and he is the Mexican Representative to the NAFTA Customs Subgroup. Mr. García was a member of the Mexican negotiating team of the Tax and Customs provisions of NAFTA, as well as those of the US-Mexico Tax Treaty, the US-MX Customs Mutual Assistance Agreement and the US-Mexico Money Laundering Agreement. Mr. García is also competent authority for the exchange of tax, financial and customs information between Mexico and the United States. Mr. García has represented Mexico Customs in numerous occasions at the World Customs Organization´s Council meetings in Brussels, Belgium, and in multilateral negotiations within the WCO, such as the one on the SAFE Framework of Standards for the Security of the International Trade Supply Chain. As an accountant, Mr. García has professional experience in tax and financial matters. Before moving to Washington he worked in the private sector for eight years. Mr. García has also taught macroeconomics and he obtained a Master’s Degree in Business Administration from the Instituto Tecnológico y de Estudios Superiores de Monterrey in 1984. Maria Elena Giner was selected to be General Manager of the Border Environment Cooperation Commission (BECC) by its Board of Directors in October 2010. Prior to being selected to the top position for the institution, she held various positions since she began her career with the BECC in its infancy, February 1998. Much of Ms. Giner’s work at BECC has focused on adjusting, modernizing, and fine-tuning the organization in accordance with the dynamic needs of the border region including the interests of each federal administration and stakeholder communities. Ms. Giner earned a Bachelor of Science in Civil Engineering from Loyola Marymount University and a Master of Business Administration from the University of Texas at El Paso. She is a registered engineer and has almost 30 years of experience in the water, wastewater, and solid waste fields. Her previous work experience in the public sector includes various civil engineering positions at the Los Angeles Department of Water and Power, Metropolitan Water District of Southern California and the consulting firm Carollo Engineers. American Science and Engineering develops, manufactures, markets and sells X-Ray inspection and other detection solutions for homeland security and other targeted markets. Prior to joining AS&E, Chrisos served as Vice President of Sales for North America and Europe of Nexx Systems Inc. Chrisos has more than twenty years o experience with semiconductor equipment manufacturers including his role as vice president account management and global operations at PRI automation. A conservative community leader, United States Congressman Pete Sessions has combined hard work, innovative thinking, and common-sense principles to successfully represent the 32nd Congressional District of Texas. He graduated from Churchill High School in San Antonio and went on to graduate from Southwestern University in 1978, where he now serves on the Board of Trustees. He worked for then-Southwestern Bell Telephone Company for 16 years, retiring as District Manager for Marketing in Dallas. As a businessman, he served as Chairman of the Northeast Dallas Chamber of Commerce. In 1996, went to Washington, DC to represent them in the United States House of Representatives. In 2002, Congressman Sessions began representing the 32nd Congressional District, created from redistricting. In 2014, the people of the 32nd Congressional District called him back to Congress for his tenth term. Congressman Sessions pursues his goals on these and other issues through his work on various Congressional committees and caucuses. He serves as the Chairman of the powerful House Committee on Rules, which is best known for its role as the legislative gatekeeper. In 2008 and 2010, he was elected by the House Republican Conference as Chairman of the National Republican Congressional Committee. José Zozaya has a Bachelor’s Degree in Law from Universidad Iberoamericana and Postgraduate Studies in Corporate Law and Economic Competition from the Mexico Autonomous Institute of Technology (ITAM). He was appointed President and Executive Representative for Kansas City Southern de México (KCSM) on April 2006. During his eight years in the railroad sector he has reached significant achievements for the company and for the industry in Mexico. José Zozaya has over 40 years of experience in law and government relations, as well as mergers and acquisitions that have been fundamental for the construction of strategic relations between KCSM and the three levels of Government in the country. Under his leadership, In February 2010 the trackage rights agreement was achieved after a 12-year process which has brought major integration between the main railroad companies in the country providing benefits to railroad users and consequently to the sector as a whole. Before becoming part of KCSM’s executive team, he served as legal and government relations director for ExxonMobil Mexico for nine years. 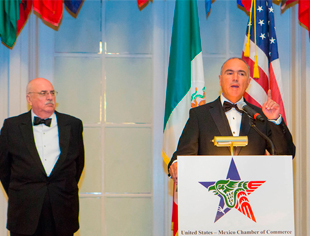 He was National President of American Chamber Mexico for 2 terms from 2010 to 2012, becoming the first non-American to hold this important position. Currently, he is Vice President of American Chamber Mexico and of the Association of American Chambers of Commerce in Latin America (AACCLA). José Zozaya is also a Member of the Board of Afore Siglo XXI and Ferrovalle, SA de CV. In April 2013 he was appointed President of the Mexican Railroad Association (AMF). On November 2014, he is elected President of the Mexican Council of Transport (Consejo Mexicano del Transporte, CMET). In 2010 he received the Degree of Doctor Honoris Causa awarded by the Mexican Academy of International Law and was granted the Guerrero Aguila 2010 award from the Coalition of Speakers, Poets and Writers United for Mexico and the Chamber of Deputies. Will Cusack is a results driven sales and business development professional with expertise in transportation, logistics, manufacturing, state & local government, services and telecommunications verticals. Demonstrated expertise developing new markets with extensive technical consulting and sales background in mobile computing, advanced data capture, M2M, software applications and wireless communication networks in both domestic and international markets. Prior to joining Zebra Technologies, Bill served as a director at Motorola Solutions where he led the mobility consulting practice for the North America transportation and logistics vertical. Over the past 25 years, Bill has held key positions with leading technology companies creating competitive advantage and business growth through innovation, business acumen and technology expertise. Bill successfully leverages his deep domain industry and technology knowledge offering clients a unique trusted advisor perspective in the purchasing process. Develops innovative solutions for clients to create market advantage and revenue growth opportunities. Cate Luzio is currently Executive Vice President and Co-Global Head of Multinational Coverage for Global Commercial Banking (CMB) at HSBC. In this role Cate is responsible for developing and strengthening HSBCs subsidiary coverage of multinationals (MNCs) globally. She joined HSBC in December of 2014 and is based in New York. Prior to joining HSBC, Cate spent over 6 years in London with J.P.Morgan and was most recently a Managing Director and the Head of Multinational Corporate Banking in EMEA (across Europe, the Middle East & Africa). From 2008 to 2011, Cate was the Head of International Commercial Card in Treasury & Securities Services. She has also worked at Bank of America where she held various roles. Her last role prior to leaving Bank of America was acting as the COO/Business Management Executive for Latin America and Canada within Global Corporate and Investment Bank. Previously, Cate spent several years at MBNA, where she was a Senior Vice President within the Global Development/M&A organization. She was responsible for MBNA’s entry into Mexico and acted as COO for this entity in country. Cate also spent the early part of her career working in the High Tech/Telecom industry, setting up joint ventures with local Corporates and Telecoms in China. Cate holds a Master’s Degree in International Relations from Georgetown University and a Bachelor’s degree from University of Maryland in Political Science and Spanish. Cate has held a number of executive sponsor positions for various diversity and women’s groups in her career including acting as executive sponsor for WIN (Women’s Interactive Network) EMEA for J.P. Morgan in London and was the executive sponsor for the Women’s MD Forum as well. She was also a Senior Sponsor for NextGen, J.P.Morgan’s forum for early career professionals and was a Corporate sponsor/member for Women on Boards UK. She has become increasingly active in various national level charities including Dress for Success, Shelter UK and the Great Ormond Street Hospital as well as Susan G. Komen Foundation and Junior Achievement in the US. Now at HSBC, she has joined the People Committee in the U.S. as the senior representative for Commercial Banking. Cate is also a Board member for the US-Mexico Chamber of Commerce. She was named Top 25 Women to Watch in American Banker for 2015. Former Ambassador of Panama to the U.S. Juan B. Sosa arrived in Washington, D.C. in October 1987 as Ambassador of Panama to the White House representing the Government of President Eric A. Delvalle. Ambassador Sosa has been in the private sector since 1963, having worked for Colgate Palmolive Company at the beginning of his career as an international marketing executive, and from 1969 to 1988 as Chairman of the Board of his own business and marketing consulting company specializing in market research, political polling, social forecasting, and media. Between 1985 and 1987 he served as Chairman of the Board of Air Panama, the national airline, and between 1987 and 1989 as ex-officio Member of the Board of Directors of the Panama Canal Commission. In 1994, Amb. Sosa; co-founded the U.S.- Panama Business Council, the business organization that took the initial step for a U.S.- Panama Free Trade Agreement. He served as its CEO until August 2014 when he became President Emeritus. In the political arena he was Chairman of International Relations of the Republican Party of Panama. In September 2014 Ambassador Sosa was elected Chair of the Latin America and Caribbean Region of the Houston Mayor’s International Trade Development Council and in the same month was appointed General Consul of Panama in Houston, Texas. In November 2014 he organized a Trade delegation to Panama led by Houston Mayor Annise D. Parker. 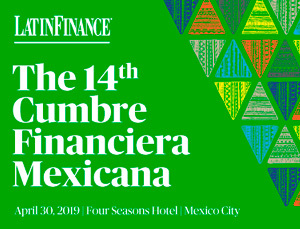 Juan Francisco Torres-Landa has distinct skills gained during more than three decades of practice as a corporate lawyer in Mexico. He has helped many companies establish a presence in Mexico and grow over the years. His long-term involvement in corporate deals of all kinds allows him to help clients better navigate complicated projects, joint venture arrangements, and M&A deals in general. A combination of experience and know-how results in a lawyer who sees the big picture and paves the way to better results and fewer obstacles. He serves clients in many industries, with a particular focus on the automotive sector. Companies rely on his insight that stems from decades of experience and thorough knowledge of corporate, contractual, foreign investment, environmental, antitrust, and tax matters. He is well known in the legal community for his responsiveness and careful, results-oriented approach along with his successful track record as a trouble shooter and his commitment to pro bono and citizenship programs.